Backup power design for a high-performance building is required, and offers many benefits. Electrical engineers must consider many factors when designing backup, standby, and emergency power systems. Safety, maintainability, code compliance, and economics play crucial roles in determining the topology of an emergency system for a critical facility. Specific requirements for emergency power vary based on building-occupancy type, facility use, and critical function (see Table 1). This article focuses on using backup power as an alternative source of the main utility in high-performance buildings, with Graton Resort and Casino in Rohnert Park, Calif., as an example. The property uses three parallel diesel generators as its backup power source. What is a high-performance building? A high-performance building is a building that integrates and optimizes, on a lifecycle basis, all major high-performance building attributes, which include energy-conservation, environment, safety, security, durability, accessibility, cost-benefit, productivity, sustainability, functionality, and operational considerations (i.e., schools, libraries, factories, etc.). With energy codes becoming more stringent concerning energy efficiency and increasing federal incentives for buildings that are eco-friendly, owners/clients would rather go this route when designing their building, which can be cost-effective when the building is complete. One must take note that the design of a backup power system for a high-performance building isn't much different than for a standard building with similar qualities. Having the knowledge in backup power design for emergency, legally required standby, and business critical loads is an important skill for electrical engineers and designers to have and can sometimes be complex. When designing backup systems, electrical engineers and designers must assure that the backup power and the building's electrical systems can handle the critical loads accurately and adequately. They also have to take into account that the systems need to be code-compliant with their authority having jurisdiction. TheInternational Building Code (IBC)-2015 dictates the exact requirements for these specific systems, such as emergency and legally required standby power.NFPA 70-2017: National Electrical Code (NEC), Article 700.12, and the California Electrical Code (CEC) require emergency power systems to automatically start within 10 seconds and run at full capacity when there is power failure. The three key articles from the NEC that must be taken into consideration when designing backup power systems are Article 700, Emergency Systems; Article 701, Legally Required Standby Systems; and Article 702. Optional Standby Systems, which clarify what one should consider emergency and standby. Power and lighting in fire command centers. Emergency/legally required power room-cooling systems and controls. Sliding doors for rated openings. Elevator machine room cooling systems and controls. Air compressors for dry-pipe sprinkler systems. Clean agent fire suppression systems. Article 702, Optional Standby Power, is intended to supply power to public or private facilities or property where life safety does not depend on the performance of the system. These systems are intended to supply onsite-generated power to selected loads either automatically or manually. This section also is considered business-critical loads. These loads are typically owner-selected equipment. When separating your business critical/optional standby loads from emergency and legally required standby power, it is always best to identify the owner/client's emergency requirements. There may be times where the business needs require high reliability, thus one must be able to adapt the backup power system to the client's needs and still provide the most appropriate degree of life safety for the occupants of a building in accordance with the code. Even though parallel systems can at times seem complex, they have greater advantages with respect to reliability and redundancy. The backup power source for Graton Resort and Casino uses multiple generator sources paralleled together to provide flexibility in load management, increased reliability, and the capability of maintenance with little to no disruption. The generators are paralleled to a common bus of the system in a separate raceway from the normal power, which serves the emergency and business critical loads, especially, for system response time and dynamic load response once the generators are in operation. Redundancy. The redundancy of the multiple generators in Graton's backup system provides greater reliability than a single generator unit for critical loads. In the event of a failure of one generator, the backup loads will be redistributed among the other generators in the system on a priority basis. The emergency loads that require the highest degree of reliable backup power quite often account for only a fraction of the overall power generated by the system. In a parallel system, this means that the most emergency elements will have the redundancy necessary to maintain power even if one of the units goes out. If an N+1 configuration is adopted, one generator can be offline for maintenance while still serving the required loads. Furthermore, providing a running spare N+1 generator will increase the reliability of the generator system from 98% to 99.96% reliability. One of the primary purposes of redundancy is to eliminate single points of failure. Caution must be exercised to ensure these single points of failure are not simply moved to another part of the system. The controls enabling redundancy also must be analyzed to avoid failure modes that compromise reliability. For example, paralleled generator sets that rely on a single master control for signals to start and close to a paralleled bus actually replace one failure point with two, as the master control and the communication link between the master and the generator sets each represents single points of failure. A well-engineered paralleling system will have dual hot backup control systems, redundant communication pathways, redundant battery-select dc power supplies, selectively coordinated breakers and multiple power pathways, and a well-documented procedure for system recovery whenever a component fails. With an N+1 parallel generator system, if at one point one of the generators fails or requires maintenance, the individual unit can be taken off the bus without affecting the other generators that are connected to the bus. This provides additional protection that ensures an uninterrupted supply of power for the building's critical circuits. To avoid load sharing among the generators, it is always best to match the new paralleled-system generators with the same manufacturer, ratings, and type. It is even more important to do the same when modifying an existing system. Standardization of the generator model type enhances maintenance and operations of the generator system. Efficiency. This is a key factor of a high-performance building. The more efficient the system is, the more stability you have, which reduces cost and losses. Having the functionality of three generators in lieu of one larger generator to handle the load makes the system more versatile and economical. Because loads do not remain at a constant level, the inconsistent power demand can cause a single larger generator to run at loads below 30% of its maximum capacity, which could cause wet stacking and lead to low fuel efficiency and more frequent maintenance. The optimal operational point for generators is between 75% and 80% of its rating. Ensuring that the generators are at this optimal point will reduce maintenance and fuel costs. Expandability. When sizing generators to match system load requirements, it often can be difficult to properly project the increases in load and adequately plan for unanticipated additional requirements. If the load projections are aggressive, the initial investment for a generator may be higher than necessary. If the load projections are inadequate, the standby power system may be compromised or expensive post-installation upgrades may be needed. Graton's parallel system offers a level of scalability and modularity that allows for variations in load over time and optimal operation of the installed units. 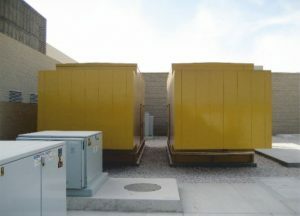 If the physical space of the generators is planned properly, additional generators can be added in the future if needed (see Figure 1). System testing. A very important requirement for emergency/standby systems, the system-testing procedure ensures that a high-performance building is safe, secure, durable, and productive. NFPA 110-2016: Standard for Emergency and Standby Power Systems includes Emergency Generator Testing Requirements for Emergency Power Supply Systems (EPSS), which sets safety standards to protect building occupants by making sure generator-powered backup lighting will operate as expected. Monthly and yearly tests are performed on generator systems whose failure could result in death or injury. Should a generator system fail the EPSS monthly test, it must be repaired immediately and retested until the emergency system passes. No-load testing. During no-load testing, the generators are started, synchronized, and connected to the generator bus without taking on load. This test will not have any impact on the load fed from the utility and can be scheduled to occur at regular intervals (engine exercise setting). No-load testing determines whether the engine can start when given a signal to do so, but will not indicate whether the generator will actually carry the load. An on-load test can determine if the generator system can carry the critical load reliably. Onload testing. During onload testing, the load is gradually transferred from the utility to the generators via closed transition, runs for a period of time, and then is transferred back to the utility. Running a generator system under actual facility load is the only true way to test its capability to operate as specified. There are many engine and generator components that must see real operating conditions to provide confirmation of their ready state. NFPA 110 requires that diesel generators be exercised monthly for 30 minutes at operating temperature and every 3 years to at least 30% of nameplate load for a period of 4 hours. One last step in the sizing equation has to do with future needs. The general rule is to always size the system 20% to 25% more than its maximum demand. Power use is not always fixed and tends to grow over time. Therefore, any generator-set-sizing exercise needs to take system expansion into consideration. Even with sophisticated software, the final decision on generator set size needs to be tempered with judgment.